CMC Flow is an innovative service which enables organisations to maximise their own unique resources, efficiently creating high quality, flexible and dynamic content for platforms ranging from traditional exhibitions to social media streams. Assess and organise resources (stories, objects, photographs, audio recordings and more) into a carefully tailored online digital asset management system. Use these resources to create high quality, cost effective exhibitions, websites, mobile apps and social media interaction. 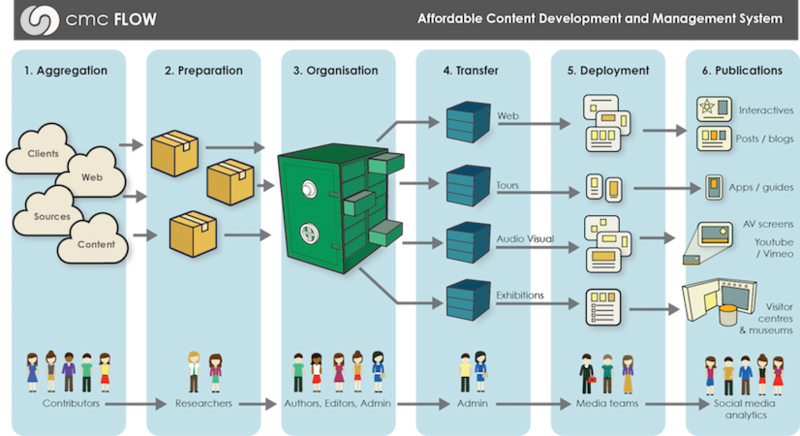 Efficient and flexible systems ensure all content remains dynamic and can be constantly updated. Full training and ongoing support for professionals and volunteers using CMC Flow is provided by CMC Associates, a highly experienced team with a unique blend of skills in digital technology, design, interpretation and social media.